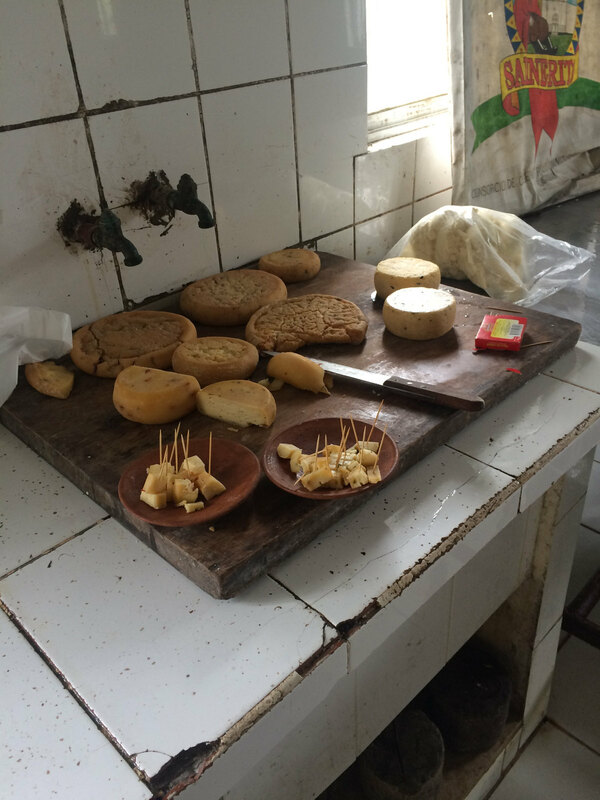 Today’s WineAndCheeseFriday entry has Andean Culture, song and dance, and a cheese-making facility! If you read about Viña Florida y Queso Amasado, http://wineandcheesefriday.com/vina-florida-y-queso-amasado/, a few weeks back, then you know that we found some cheese produced nearby, at a local farmer’s market. 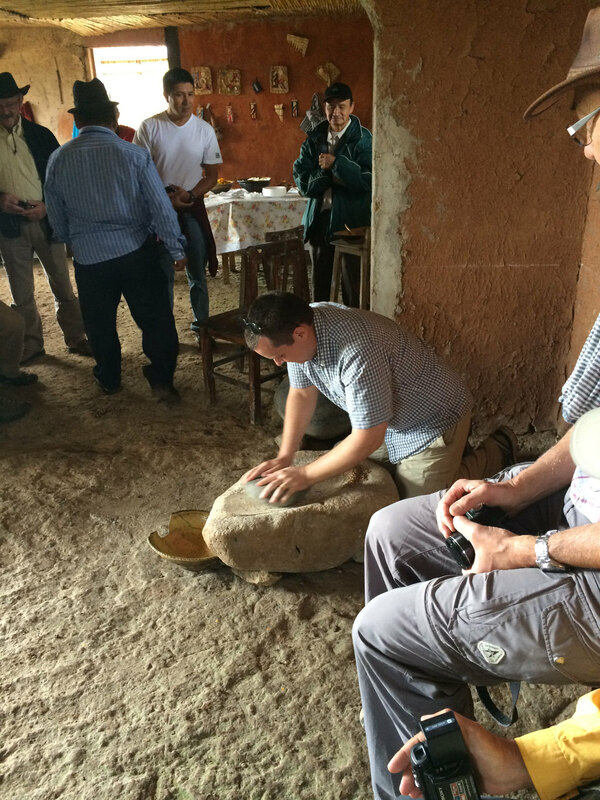 We were fortunate enough to be able to head out to Tarqui, the village where it is made, for a tour. Our contact that sold us the cheese, Miyo, let us know that there was a tour scheduled and that we could come out and join them. We had a bit of an adventure getting to Tarqui but only because we really haven’t ridden the busses much since we’ve been in Ecuador. After asking many people directions, we were finally on the bus, heading in the right direction. 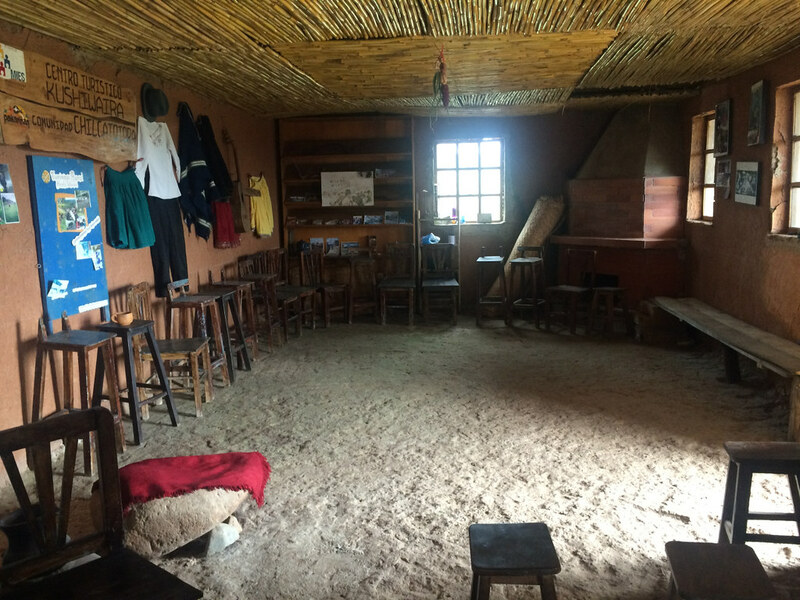 We arrived in the town of Tarqui, where we got into a taxi and made our way up the dirt road to the village of Chilcatotora. We saw a giant tour bus going in the same direction as us so we figured we were in the right place. Funny enough, once we met the tour, we found out they were French-speaking people from France. This did add a level of translation and understanding but we are always up for a challenge! The tour began with introductions of the staff (we would be working with Carmen) and a little history of this location. We were surprised to find out that nobody lives in the building we visited, it’s more of a community center where tours take place. 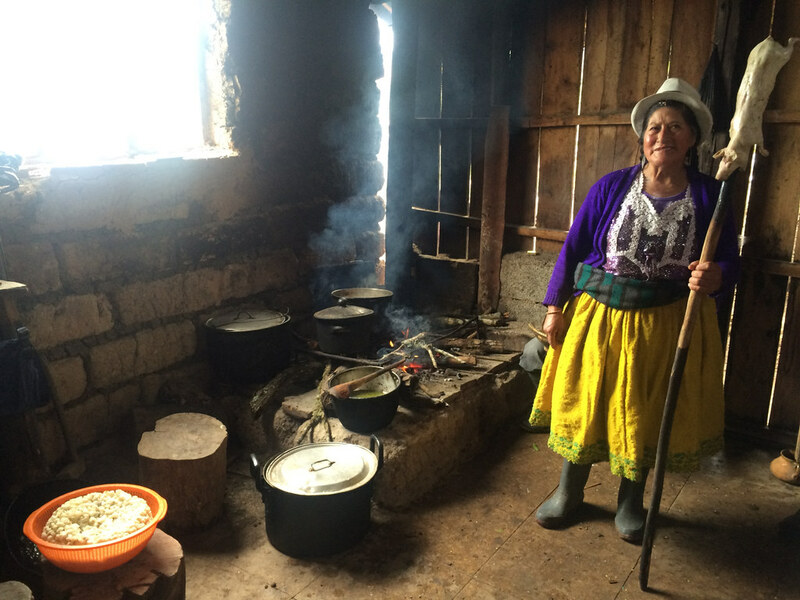 These tours showcase the Andean culture and heritage in the neighboring 26 communities. This facility is run mainly by women, the main farmers of the community. They all farm together while the men head into town to work. Once or twice a week, they also head into town to sell their produce and cheeses. It was showcased that this is their tradition and that the women are proud to be farmers. Once the history session was finished, we all toasted with a drink that reminded us of sake. Cheers! But that wasn’t it for tasting, next was an aromatic tea made from medicinal herbs and a spinach tortilla. 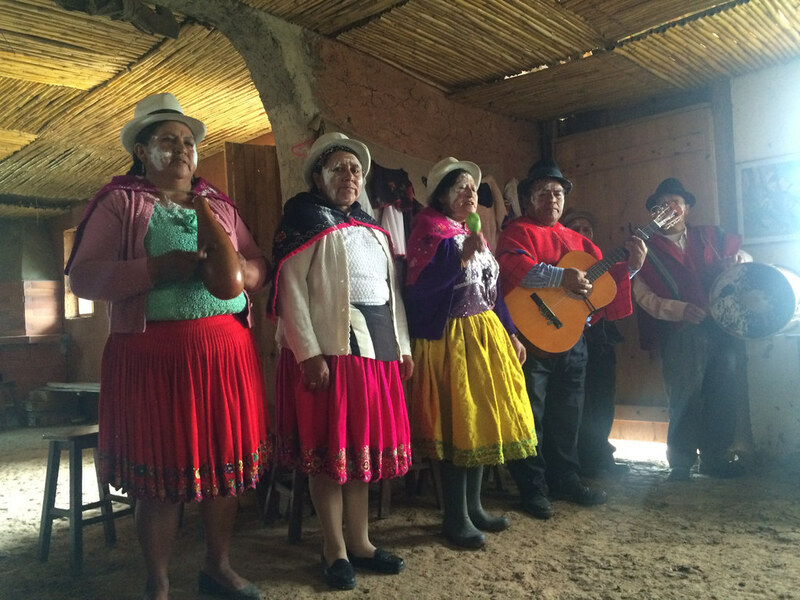 After we were sufficiently fed, our guides performed some song and dance for us. They were demonstrating songs and traditions shared at Carnival, a celebration that takes place at the beginning of February. The songs were spoken in their native language and were very upbeat and cheerful. You know it’s Carnival when you see people getting doused in flour and confetti. At first it was rubbed on their faces, then a little extra was dumped in their hair. Lucky for us, none of us ended up wearing any flour! Before we left the tour facility, we were all invited into the kitchen to see how the food was prepared. Carmen explained what each ingredient was and pointed out that they cook everything over a fire since their is no stove in the building. We got to see all courses of the meal including the meats, veggies, tea that was brewing and figs that were marinating. We would be ending our tour with lunch and a taste of all these foods. Next up was a hike down the hill to visit the “Queseria”, the main cheese making facility. This portion of the tour was run by Manuel, who has been working there for ten years. They make 5 or 6 different cheeses all from cow’s milk. He told us about the different sized molds that they use depending on the size wheel they want. This makes sense but we’ve never learned about the molds before. Pretty cool! 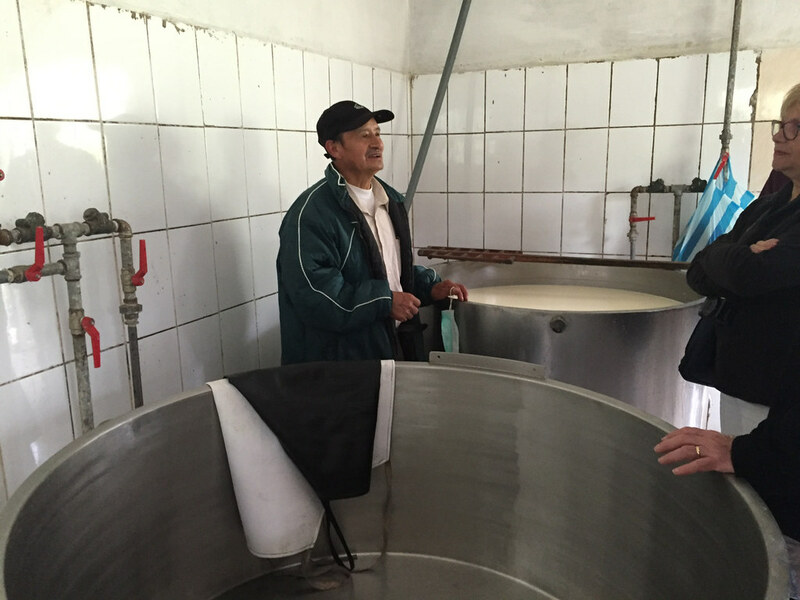 He described the entire cheese-making process but unfortunately some of that was “lost in translation” for us. There were definite steps of heating, cooling and stirring. 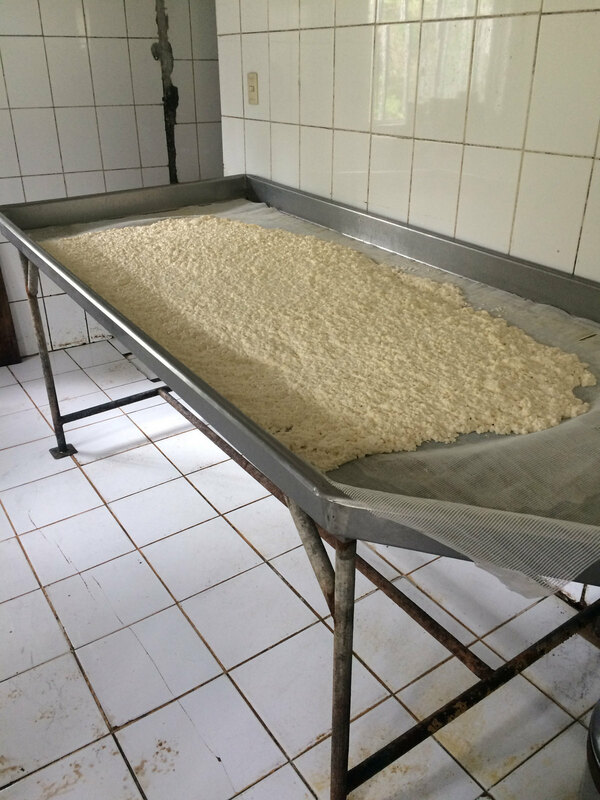 We also picked up that each cheese goes through a slightly different process and that the “queso maduro”, their aged cheese, ages for around 2 months, as opposed to their fresh cheeses. After hearing about the aged cheese, we were given two samples. One of them was pretty stinky and harder with a savory herb. The other was a little smoother but had a red spicy pepper in it. We are still trying to figure out which “queso maduro” would be better with wine. As our cheese tour was ending, we asked where the cheese was aged. They said their cave was underneath that building but we were about to leave. At least we got to see the curds that were sitting out draining in preparation for Mozzarella. After a walk back up the hill, we took some time to rest and smell the flowers. Well not really smell them but learn about all the medicinal plants in their garden. They had all sorts of plants there, some were put into salads and others were made into a tea. It was pretty interesting to see some plants that we see growing all the time in the US and learn that they can be used in so many ways! They even had some crops for food including corn and quinoa. As you travel around Ecuador, you will see corn all over the place. It is used as a flour, vegetable, snack, and entree. You’ll even see it growing in some peoples yards instead of grass! We had certainly worked up an appetite with the hike back up the hill but first we watched a demonstration on how they grind flour. It was pretty impressive that it only used 2 rocks. Once the demonstration was over, a few brave people took turns grinding, including Neil and I. He said it smelled like wheat puffs. Then we found out that it was a combination of wheat and barley. Since Neil is gluten intolerant, he couldn’t taste it but just about everyone else did. It definitely reminded me of cereal but I could have used some milk too since it was so dry! Then without further ado, lunch was served! 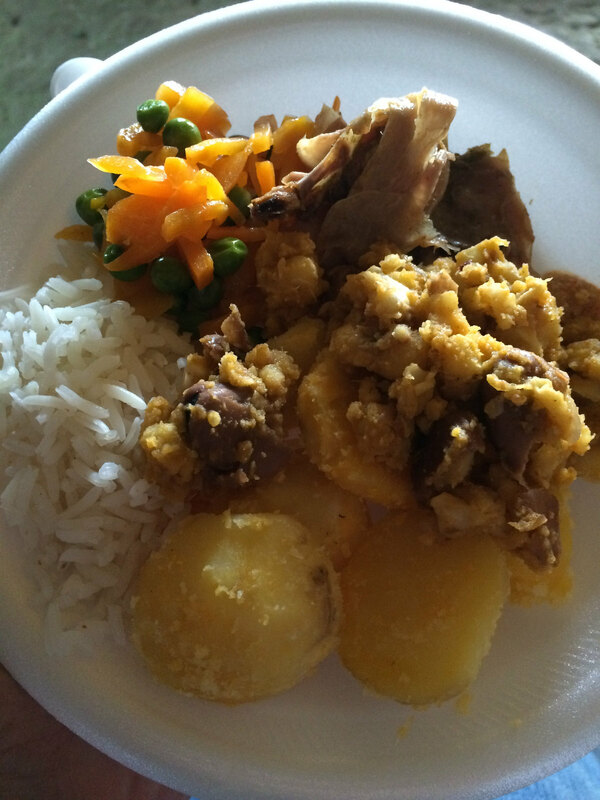 It was all food that would be found on the dinner table in Ecuador, including potatoes, rice, a mix of beans and corn, a mix of peas and carrots, cuy, and chicken. Maybe you are not familiar with “cuy”? You probably noticed it during the pictures of the food being prepared, it’s guinea pig, and is considered a delicacy in Ecuador. We both tasted it and found it to taste similar to a salty chicken. Just be careful when you eat it, because it has all the bones and insides too. We really enjoyed all of the food, and dessert was even better. 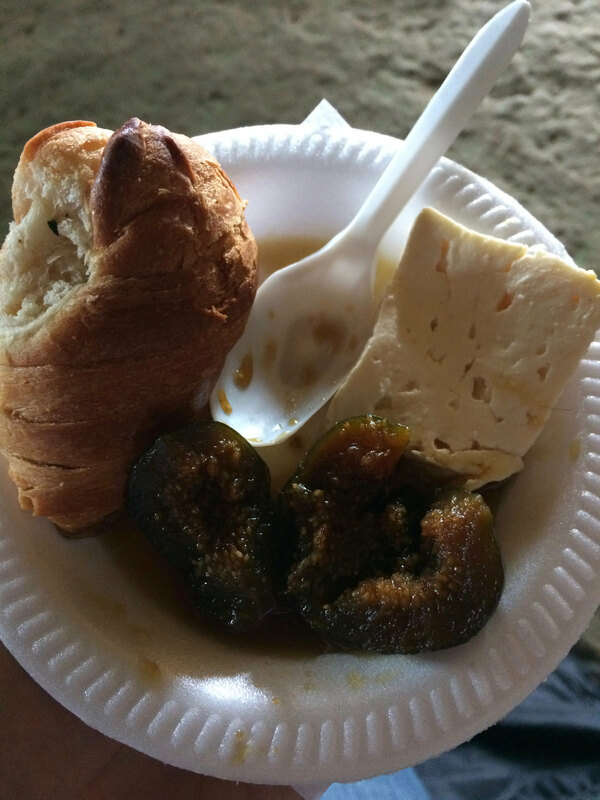 We had bread, fresh cheese, and slow cooked figs. The bread was soaked in the juice from the figs and made it that much yummier. We even tried another one of their traditional drinks, Horchata tea, a pink beverage that is made from herbs and flowers. And when we left, all of our new friends waved goodbye from the porch. What a fun experience! Thanks again to Carmen, Julio and Manuel and all the others for such a great experience, and Miyo for inviting us out! 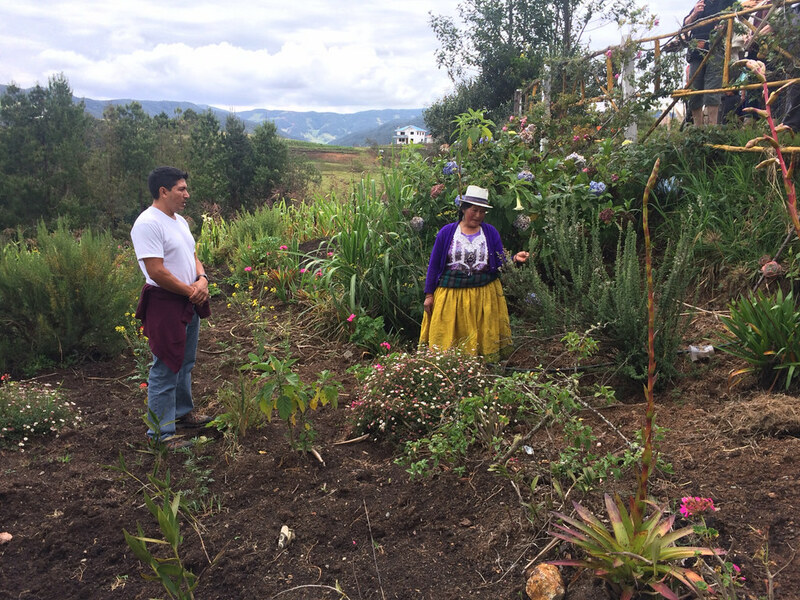 If you are traveling to Ecuador and would like to take a trip out to visit them, their contact info is available on this link, http://www.redturs.org/nuevaes/articulo.php?ar_codigo=527&ca_codigo=30&ca_padre=.